For example, let's say you are a guitarist and want to save typical sound patches. The Chainer enables you to load up to 32 effects in series or parallel. So you may want to load and save a compressor, an EQ, an Amp sim, a delay, a reverb, a chorus, etc, and save the whole thing within a patch that can be loaded in other sessions or even other DAWs. The same concept can be applied to vocal patches, drum patches, or any other typical effect chains that you want to recall in future sessions. A time saver ! The chainer natively contains all of the 50 P&M V.I.P. Series plug-ins making it easy to save/load chained presets of your favourite P&M Plug-ins. The Chainer is FREE for all REGISTERED P&M Plug-in owners. Therefore, the Chainer will automatically detect any authorised P&M plug-ins, ready to use. They can be chained in series or parallel to save/load presets that can be used in other sessions or even other DAWs. When AUTHORISED, the Chainer works as a VST Wrapper utility that can load and "Chain" any VST effects or VSTi virtual instruments. The Chainer loads as a plug-in within all major recording host applications including Pro Tools and can open up many creative sound layering and effects chaining options. A standalone version is available. It enables users to conveniently chain effects or synth patches for live performances. Download the Chainer Application. Choose your preferred platform (Mac/PC) and the format of your choice (AAX - AU - VST). Once downloaded, launch the installer. 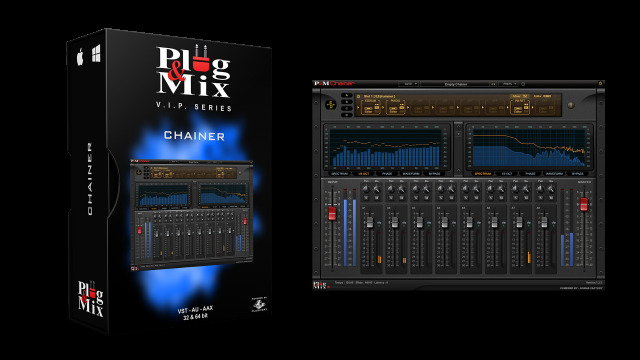 Once installed, the chainer will be available to load as a plugin from your preferred DAW. If you have authorised P&M Plug-ins on your computer, these will be natively available within the Chainer. To fully use VST effects or VSTi instruments within the Chainer, you'll need to authorise it as described in the email confirmation you receive after purchase. If not authorised, the Chainer can load VST effects or instruments but the sound will be muted for a short time every 45 seconds. Presets and automation are saved and can be recalled. - If P&M plug-ins are not authorised, they stop processing signal after 30 minutes. - Presets cannot be saved. - Controls cannot be automated. - After 30 minutes you may relaunch the plug-in for your demo to become active again. - Convenient rack-based effect chaining. - Multiple synths / effects racks with serial and parallel routing schemes. - Custom displays for visualizing sound output. - Includes AAX 64bit version for use inside of Pro Tools... a fully featured VST wrapper. - MIDI enabled plug-in that conveniently loads virtual instruments with amazing audio effects.